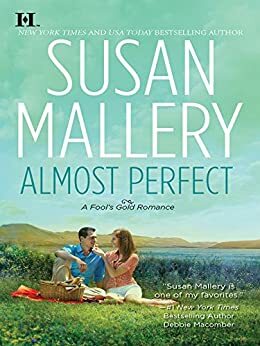 I bought this book to get to know Susan Mallery. She’s mentioned a lot of times regarding contemporary romance and I was very curious to see if her work was be something that I would like. And yes, it is! But not to the point where I’m in love! I loved her writing style with lots and lots of dialogues and with some fun passages here and there. But the characters weren’t the best. I loved Liz but I’m still mad with Ethan! Liz is a very successful and famous writer who has been raising Tyler, her eleven-year-old son, on her own. She’s a very organized mom and very good at teaching Tyler that women are just as good as men and I loved her for it! And then we have Ethan, who is the most stupid man I have ever read about. He’s so immature and idiot with Liz about the fact that the kept Tyler from him, which is not true by the way. He has the most stupid attitudes, like, I just wanted to slap him. I really don’t understand why he is the way he is. He is the oldest brother, and so when his father passed away, he was the one who had to take care of the family business, so because of that, I would think that he was the mature person in the family. But he’s not, and it is so frustrating to see what he does throughout the book. Anyhow, I really like the story. It is obvious that this is their second chance and his only chance to make it right, so even though he doesn’t really deserve Liz we’re all cheering for them! Eu comprei este livro para conhcer Susan Mallery. Ela é muitas vezes mencionada quando se fala em romance contemporâneo e eu estava muito curiosa para ver se o trabalho dela seria algo que eu gostasse. E sim, é! Mas não ao ponto de poder dizer que estou apaixonada! Eu adorei o estilo de escrita dela com muitos diálogos e algumas passagens mais engraçadas. Mas as personagens não era as melhores. Eu adorei Liz mas ainda estou chateada com Ethan! Liz é uma escritora famosa e bem sucedida que tem criado sozinha Tyler, o seu filho de onze anos. Ela é uma mãe muito organizada e muito boa a ensinar Tyler que as mulheres são tão capazes como os homens e eu adorei-a por isso! E depois temos Ethan, que é o homem mais estúpido que eu alguma vez li. Ele é tão imaturo e idiota com Liz por ela lhe ter escondido Tyler, o que não é verdade já agora. Ele tem as atitudes mais estúpidas. Só me apetecia bater-lhe! Honestamente não consigo entender o porquê de ele ser assim. Ele é o irmão mais velho e por isso, quando o seu pai faleceu, ele ficou responsável pelo negócio de família. Com isto, seria de esperar que ele fosse já uma pessoa madura. Mas não, e é tão frustante ver o que ele faz ao longo do livro. De qualquer das formas, eu gostei bastante da história. É óbvio que esta é a segunda oportunidade do casal e a única oportunidade de Ethan concertar as coisas, e por isso, ainda que de certa forma ele não mereça Liz, todos torcemos para que eles fiquem juntos!